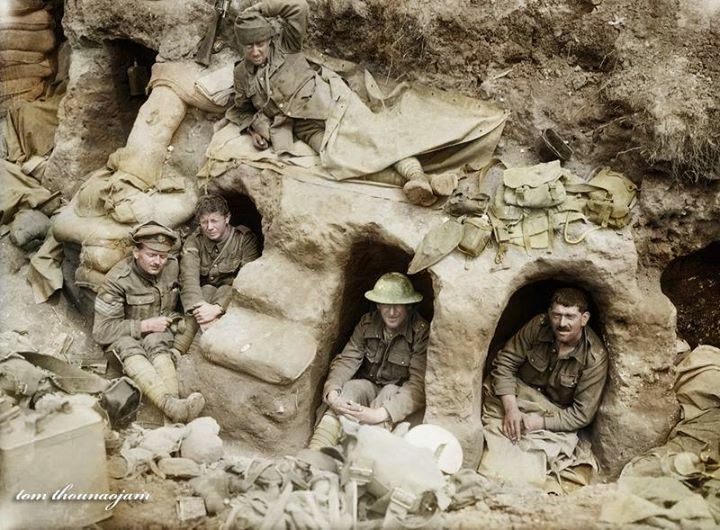 Men of the Border Regiment resting in ‘funk holes’ (scraped out dugouts) near Thiepval Wood during the Battle of the Somme, July/August 1916. 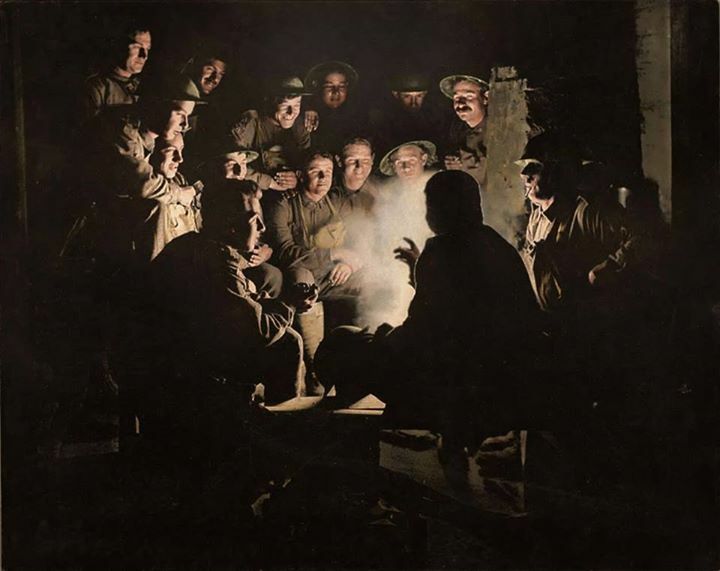 The Colour Sergeant (on the left) wears the padded cap, the man lying on the top is using a groundsheet as bedding and has laid out his 1908 pattern webbing with small pack, entrenching tool and water bottle by his feet. As Britain and France waged war against Germany in Europe and in Africa, Britain called upon help from her Imperial troops. 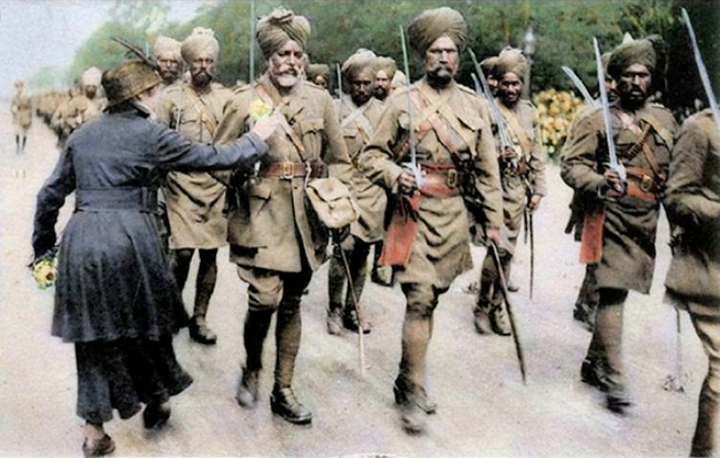 Indian soldiers in the Indian Army arrived in Europe from September 1914. The first of these Indian troops arrived in Marseilles on 26 September 1914. They came from the Lahore and Meerut Divisions and the Secunderbad Cavalry. 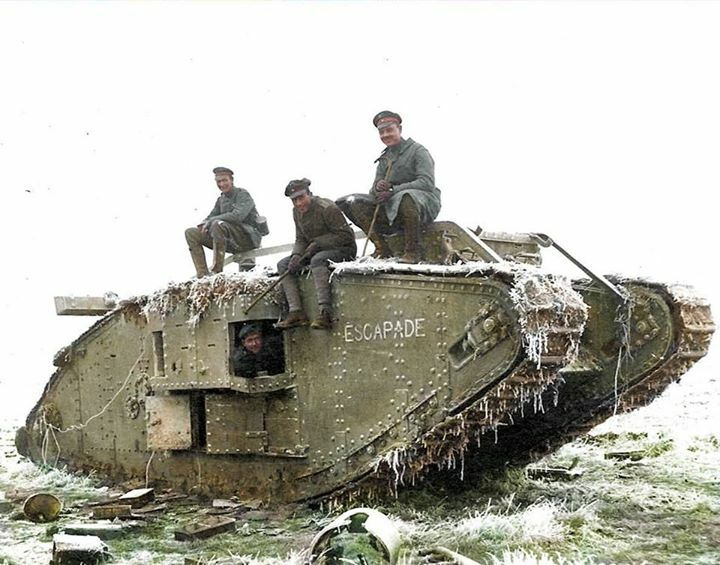 In October, Indians were fed into some of the fiercest fighting at Ypres. In March 1915, Indian troops provided half the attacking force at the Battle of Neuve Chapelle, which was the costliest in terms of lives. Wounded Indians who had fought in France were sent to Britain to recover. In Brighton, the Royal Pavilion was transformed into a military hospital for Indian soldiers. During their time spent recuperating, Indians were visited by the King and the Royal Family. Tours were also organized for them to visit London and see the sights. The religious needs of the soldiers was taken into account, with nine kitchens erected to cater for the various dietary regulations of Hindus, Sikhs and Muslims and areas were cordoned off for worship. Various other buildings were also converted into nursing homes for these soldiers. Two memorials exist in Brighton to commemorate the Indian soldiers who came through during the War – the Chattri on the South Downs and the Pavilion Gateway (unveiled by Bhupinder Singh in 1921). Possibly belonging to 152 Brigade, 51st Highland Division.